Riverford Farm in Buckfastleigh are a triumph of British farming. 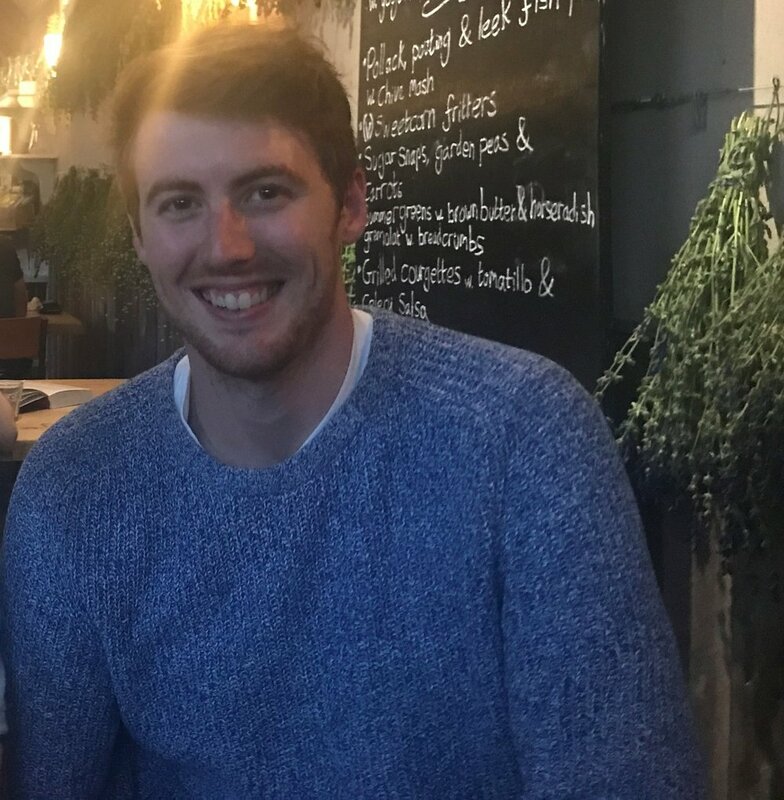 Guy Watson (farmer & founder) has taken his childhood home and family farm into the modern era by creating a hugely successful online foodbox delivery service. 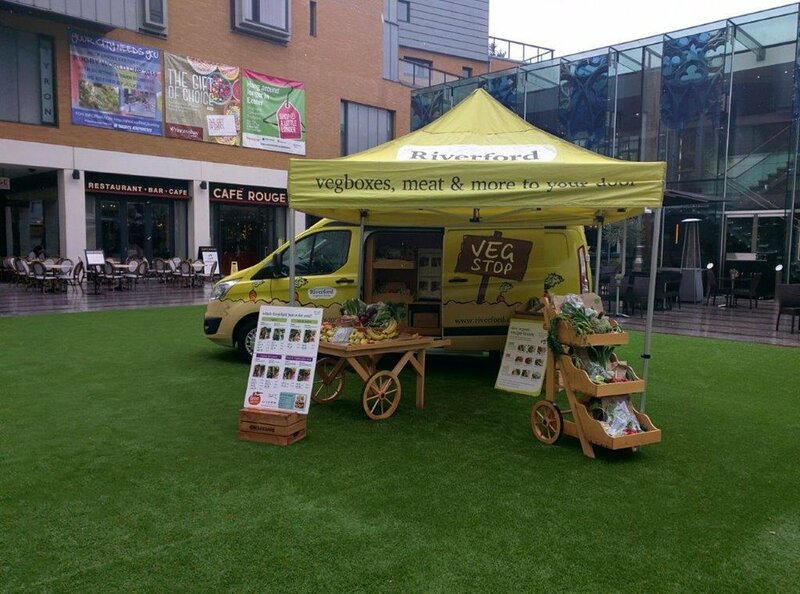 This gives homes across the UK the opportunity to sample the award winning organic produce themselves. Delivered from one of Riverford’s regional farms, direct to the door. We arrive at the field kitchen after a hop, skip and a jump from er…Manchester. This is of course via several transport hubs and some beautiful countryside. We kick things off with a pint in the local pub to wet our appetites before we move to the Field Kitchen itself. Joe Atkins who is Riverford Farm face to face operations manager and our regular liaison and dinner companion for the night, meets us. We discuss a little work, holidays and food (mostly our desire to get on and try it!). Whilst there, Joe challenged me to write a blog about our experience of the restaurant. So here is my first and most likely last attempt at being a food critic (in print at least!). Read Joe's testimonial. The Field Kitchen is as rustic and charming as you would imagine. 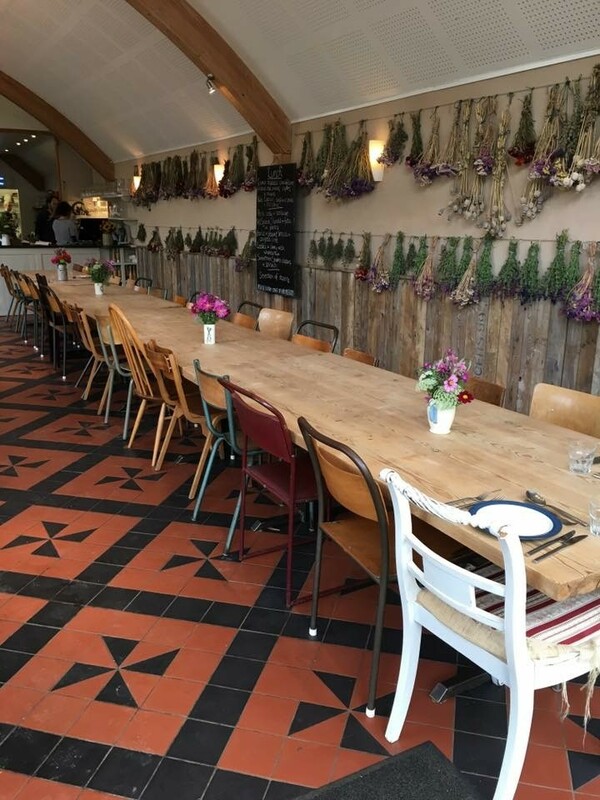 With tiled floors, wooden mismatched furniture and dried flowers (from the farm garden) lining the walls. It has a magical quality you would expect from the Weasley family home. The row of wellington boots in varying sizes lining the entrance really drive this welcomingly warm feeling home. 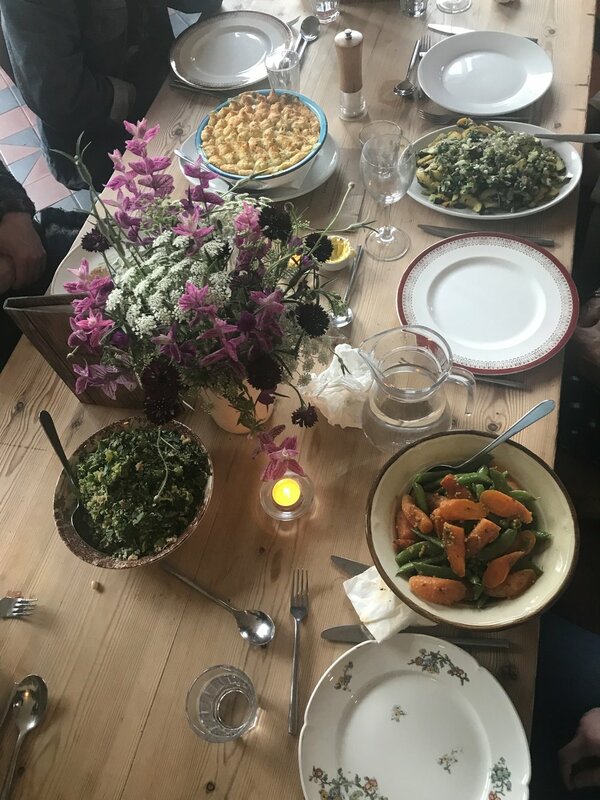 With seating for eight people per table and a set menu based on fresh produce available from the fields that day, you don’t know who you will meet or what you will eat until you get there. The job of cooking our dinner tonight goes to head chef James Dodd and his team, and he’s a bloomin’ good chef. 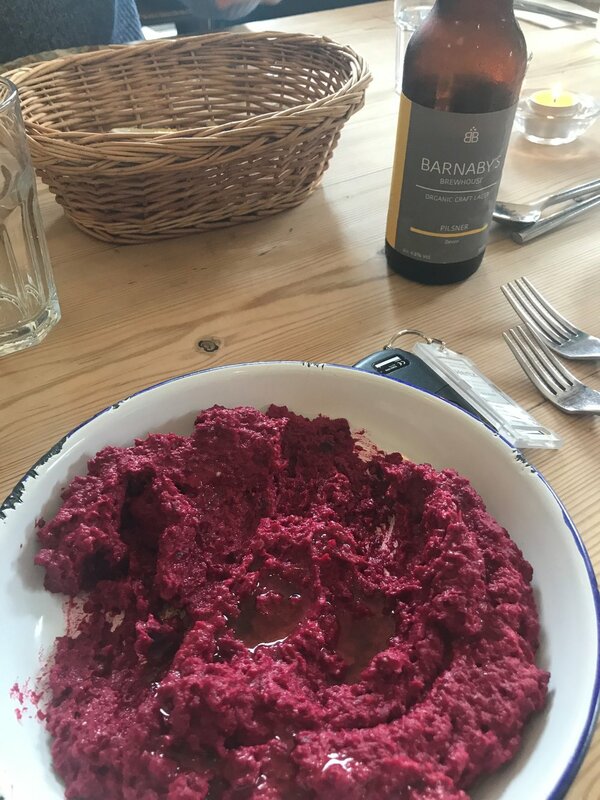 Dinner got off to a great start with some fresh baked bread and a really delightful beetroot hummus, the best I have ever tasted. This was quickly followed by full raw radishes eaten whole dipped in miso mayo. The radishes had a distinct sharp taste as you would expect. This was complimented beautifully by the mayo which was packed full of flavour. The next offering was a definite table favourite and one I will be replicating at home, corn on the cob with chilli and red pepper butter. The corn was fresh, sweet and juicy. The butter, adding another dimension was tangy but creamy and the overall effect was described at the table as having a popcorn taste. The final offering of the first course (although I would be more inclined to describe it as an unceasing loop of goodness) was a salad of baby gem, French beans and yoghurt dressing. This, although fresh, was my least favourite of the evening. I felt it was missing a vital ingredient to bring it to life of mint or chilli maybe. I think the preceding punchy dishes may have done it a disservice by making it seem lacking in comparison. There was a short hiatus in which time we talked about our favourite dishes of the evening among the other guests at our table and ordered our drinks. My companions ordered the Barnaby Brew House Pilsner which is brewed on site at the Farm using organic malt and hops sourced in the UK and fresh spring water. The brew had a typical pilsner bitterness followed by a refreshing, clean and slightly sweeter, balanced aftertaste. I opted for the cocktail of the evening which was a white rum and ginger beer. Again, sticking to their roots both ethically and in locality, Luscombe Ginger Beer is brewed using ethically sourced ingredients on a neighbouring farm in Buckfastleigh. The taste was refreshing, spicy and delightfully new to me. There was some trepidation on my part as the next course came in. Having had a bad experience with a fish pie some years earlier this is something I would not have ordered had the option been given. As it was not, I decided to get back on the proverbial bike and tuck in. What can I say other than thank you Field Kitchen for curing me of my Fear (albeit irrational) of fish with mash potato. The pollock and pouting was cooked to perfection in a thick, creamy leek sauce which was packed full of flavour. The mash was smooth and perfectly seasoned with the subtle garlicky onion flavour of chive running through it. Accompanying this triumph was a fresh medley of garden vegetables sugar snap, peas and carrots. Perfectly grilled courgettes with a tart and slightly herbal tomatillo and celery salsa and summer greens with a zingy horseradish gremolata with breadcrumbs adding texture. The food at no point felt heavy or overwhelming despite the none stop supply of it on offer. This meant that the dessert menu still garnered the excitement it deserved. The table was at its most animated discussing which dessert was THE ONE to go for. Joe was adamant that sticky toffee pudding was the one. He did confess that he had tried several times to order another dessert but always loses his nerve at the last minute and goes for old faithful. His fear being that it won’t taste half as good and he will have to live with the regret. I decided to ignore the siren like calling to the sticky temptress and opt for a duo of chocolate mousse and bakewell slice. The chocolate mousse was smooth, silky and rich in deep chocolate flavours. 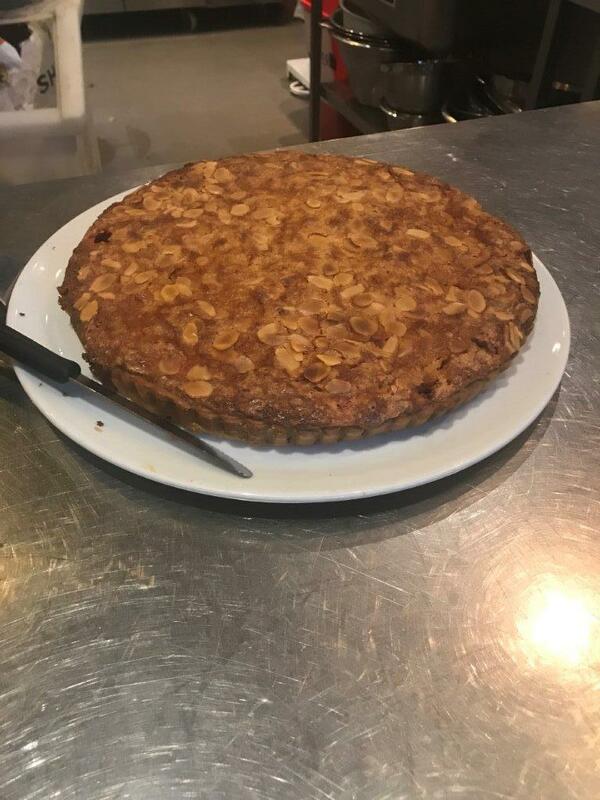 The bakewell was light, sweet and beautifully balanced. I was very much on my own though as each guest filed back from the sweet bar with you guessed it, sticky toffee pudding. The lady sat to my right, a teacher from London in Devon to visit her son, said that it was worth a visit to the Kitchen for that alone. Joe clearly was not on his own in open devotion to an old classic. My colleague on the trip also opted for the favourite and described it as the most incredible dessert he had ever eaten. Sweet but light and melt in the mouth and proper nice were his actual words. Overall the experience was a really pleasant evening with interesting company and fantastic, beautifully presented home style food. At less than £30 per head for all courses and half that for children it is a must visit for anyone finding themselves in South Devon. The setting is outstanding, the atmosphere friendly and inclusive, the staff knowledgeable and engaging and the food marvellous and inspiring. As a business, it is so important for us to get insight to who our clients are and what makes them tick. I cannot think of a meeting I have had with clients where we are left with a better understanding of who they are and what we want to achieve together. Two things I have taken from the experience aside from the amazing and interesting array of food we were lucky enough to try for free - My Spring and Summer Veg cook book and Rum & Ginger Beer work so well together…both a revelation!